The high altitude skiing up until the summer and especially Triftji moguls make the Zermatt ski area famous worldwide not only for ski holiday. 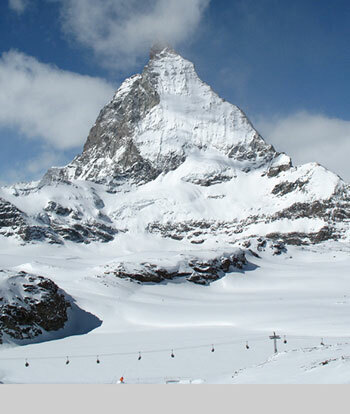 The ski area is accessible from Zermatt via two railway stations and the ski lift station. The Gornergrat bahn, cog-railway is situated near the Zermatt railway station and goes to Gornergrat as high as 3089m. The Sunnegga underground funicular enters the Sunnegga Paradise skiing area from which the ski lifts take you to Rothorn paradise. The Sunnega station is usually the Family Skiing meeting point the first day of your ski holiday. The Zermatt-Furi gondola-lift is the entrance to Schwarzsee paradise, Matterhorn glacier paradise and the Italian side Cervinia and Valtournenche. ski area offers a complete beginners area, the ”Eisfluh” including a magic carpet and a novice run down to Findeln. The other novice run starts from the Rothorn top station and takes skiers down to the Kumme. The main intermediate skiing area starts at Blauherd interchange and continues down to Sunnegga. The Family Skiing lessons usually start from this ski area which connects the runs of all difficulties. There is an advanced run from Fluhalp to Gant and two black - expert runs.The first from Fluhalp to Patrullarve called Obere national with off-piste sections off to the left of this run which terminates below the Sunnegga parradise.The second black run can be found the top of the Rothorn down to Kumme. ski area is mostly suitable for intermediate skiers with three blue runs and a couple of reds.There is a freeride area from Stockhorn and the Triftji mogul section for advanced skiers. 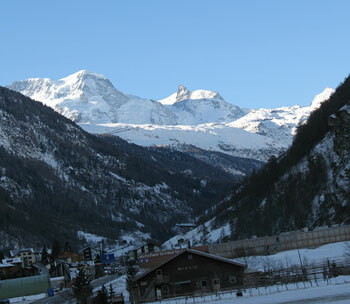 The whole area is served by the Gornergrat bahn, a 30 minute ride to the Gornergrat peak. and Schwarzsee area is the ski paradise for all skiers.The highest altitude run the Matterhorn begins at about 3500m and is also a connection to skiing in Italy. The are long runs back to Zermatt and the longest being from Klein Matterhorn at 14 kilometers with a vertical drop of 2.200 metres. The numerous red runs and one blue run to the Trockener Steg restaurant are skied with great views of the ever-dominant, one of the most beautiful mountains in the world, the Matterhorn. If you’re looking for off-piste skiing you’ll find lots of it here as well. With our ski school you will explore all of these areas during your ski holiday.